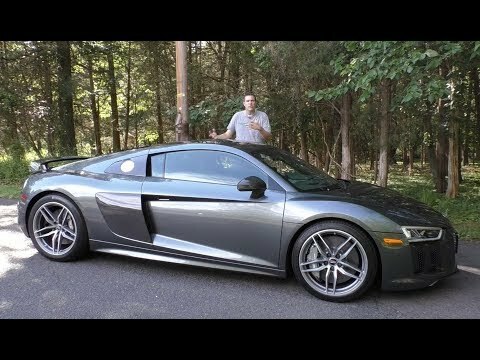 The all-new 2017 Audi R8 is a shining example of the civilized supercar. It's quick to 60 mph, has striking good looks and incredible grip, yet you can drive it to and on the track, with near-equal joy in both arenas. The wider, lighter, faster R8 benefits from Audi's racing technology, with an elegant, cutting-edge luxury interior to boot. The factory exterior paint is an exceptionally unique blue. The pros that I enjoy about my vehicle are as follows: comfortable driver and passenger experience (seats), steering wheel is tight so it performs well when taking corners, Bose speakers that provide an enjoyable car ride, as well as clarity when utilizing Bluetooth. The cons of my vehicle are as follows: quick gas consumption resulting in extra expenditures, blind spots when both reversing and changing lanes (horrible when allowing my son to drive on just learner's permit). It is very fast, comfortable and small. Love it cause it feels amazing and looks amazing. It is fast, comfortable and loud. The only con is that it is a bit small.